Designed by naval architects Joubert and Nivelt, and produced in accordance with the shipyard’s construction traditions, the Tofinou 8 is a modern sailboat with a classic and timeless line. Performing well under a light wind or a breeze, the Tofinou 8, with its responsive helm, offers sensations similar to those of a sport dinghy, easy to manouver alone or with a small crew. The hull of the Tofinou 8, marked by its straight bow and very flat stern lines, is very stable and excellent at any points of sail. In its “pivoting keel” version, its draught varies from 1.9 meters to less than 90 cm, which allows navigation close to the beach or in a shallow cove, entrance to the port at low tide, and even to run aground. In its “fixed keel” version, the draft of the Tofinou 8 is of 1.7 meters. The impeccable finish and the navigational qualities of the Tofinou 8 bring together aesthetics and the charm of regatta. It is easy to maneuver and easy to transport. Fast and stable, you’ll enjoy a thrilling and pleasurable experience whether in solitary navigation or with a crew. Performing well under a light wind or a breeze, the Tofinou 8, with its responsive helm, offers sensations similar to those of a sport dinghy, easy to manoeuvre alone or with a small crew. 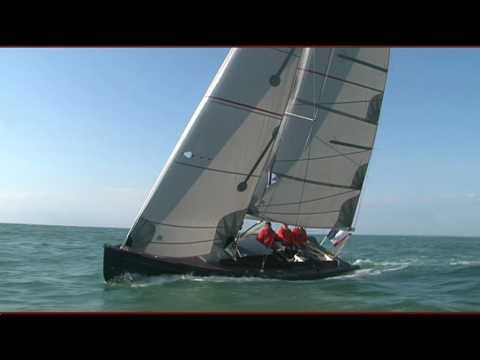 In its “fixed keel” version, the draught of the Tofinou 8 is of 1.7 meters. Standard colors: dark blue (Others colors available on options). Hull in hand laid grp with sophisticated structure of frames and stringers for reinforcement. Deck in sandwich grp construction, joined to the hull by lamination and through fastenings. Deck corened with vaccumed glud with 8 mm teak. Cockpit coamings and cabin sides in mahogany, removable for maintenance and varnishing, and covering all the halyards and sheets. Teak foot bar on foredeck. Large aft deck locker with flush lid. Toerails and tiller in varnished mahogany. Cockpit seats and sole in teak. Harken deck equipment and blocks. Mainsheet with traveller on rail. One double berths and two settee berths. 4 canvas storage pockets lining hull sides. Fresh 50 litre water tank for standard cockpit shower. Folding prop. 25 liters fuel tank. Painted aluminium mast. Halyards part Dyneema. Backstay Dyneema, adjustable under deck. Boom with provision for internal reef lines and foot outhaul. Reef lines led back to helmsman. Hydraulic system for raising and lowering the keel, with manual command, electrical command optional. We have been importing Latitude 46 boats for two decades. Please contact us to discuss how to tailor one to your needs.